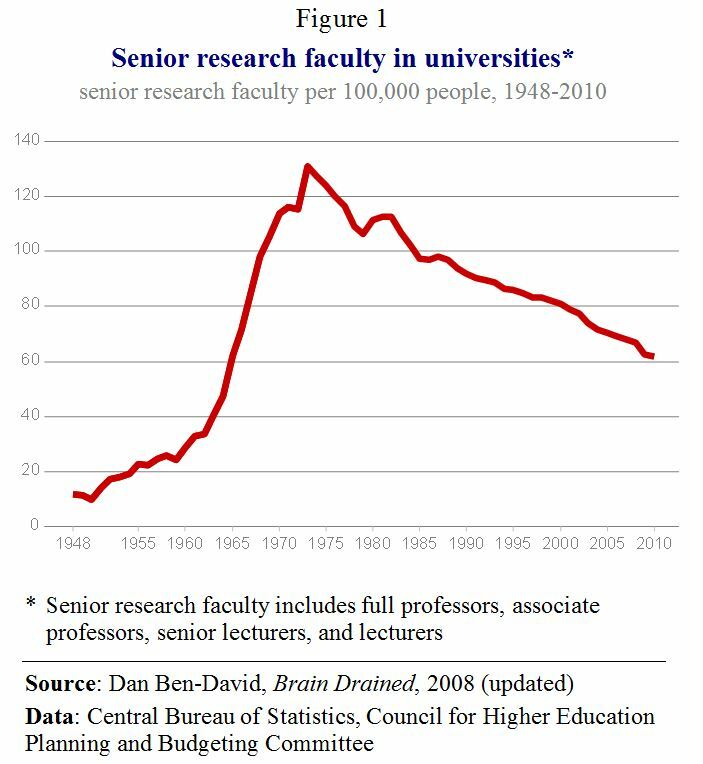 The country’s top universities have fewer senior faculty positions today than they did four decades ago. Since 1973, the number of students per professor has more than doubled. The universities have moved away from employment of higher costing academic researchers and have increasingly outsourced the teaching to non-research, external lecturers. Israel’s academic brain drain to the United States is unparalleled, with 29 Israeli scholars in the U.S. for every 100 remaining at home in 2008 (the most recent data available), an increase from the 25 per 100 in the U.S. just four years earlier. This is several orders of magnitude more than the 1.1 Japanese or the 3.4 French scholars for each 100 remaining in their respective home countries. With the beginning of the academic year around the corner, the Taub Center is releasing a study on the state of higher education in Israel. It will be published in the Center’s forthcoming State of the Nation Report 2013. As the author of the study, Taub Center Executive Director, Prof Dan Ben-David notes: “Israel established some of the world’s leading research universities during its first two and a half decades of existence despite being inundated during this period with refugees arriving with no more than the clothes on their backs, food rationing in the 1950s, repeated all-out wars and internal budgetary limitations. By the beginning of the 1970s, Israel had seven major research universities. 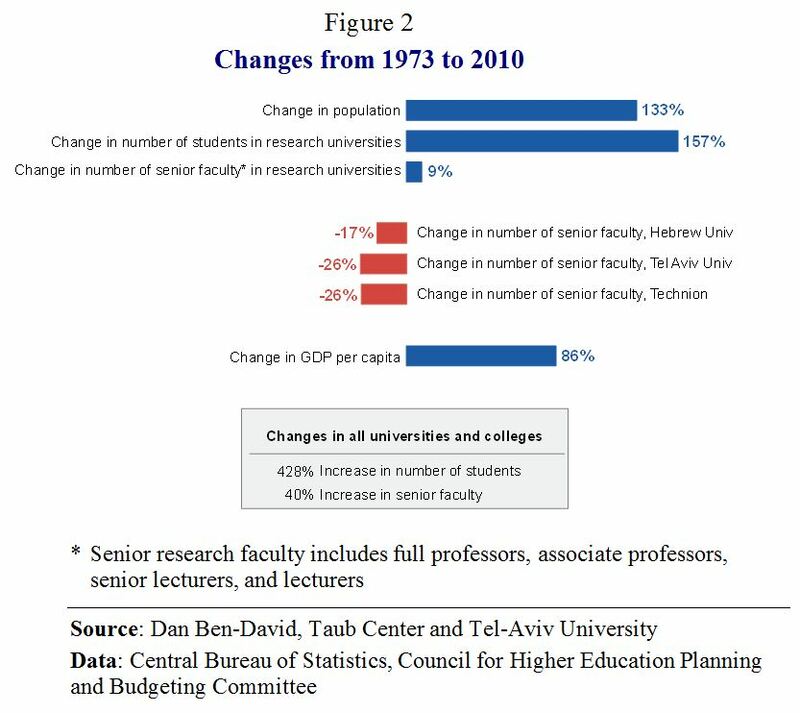 The number of senior faculty members per capita shot up and reached levels similar to those in the United States (Figure 1).” “Since the 1970s, the country is much wealthier and has significantly greater ability to develop its university system, but Israel dramatically changed course. Over the next four decades, the country’s universities steadily receded from the nation’s national priorities – as is clearly evident from the data.” Figure 2 shows the increases in population and in the demand for higher education between 1973 and 2010, and the government’s reaction in terms of financing academic positions in the country’s public universities. Figure 3 show that Israel’s population increased by 133 percent, the student population in its research universities expanded by 157 percent and the number of students in Israel’s entire higher education system (including colleges) rose by 428 percent. The Taub Center study found that the number of senior faculty in the research universities rose by just 9 percent while the overall change in senior academic faculty in all of the colleges and universities rose by only 40 percent. 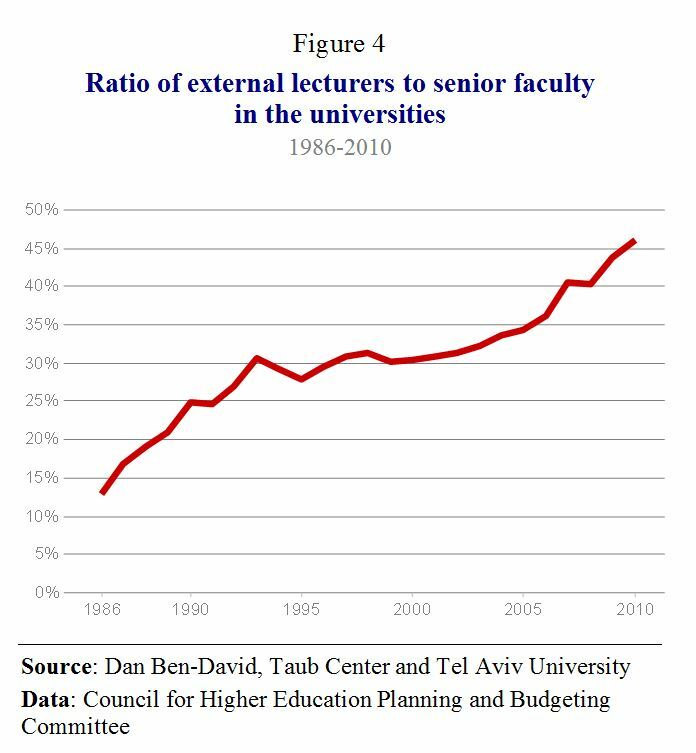 The size of the academic faculty in Israel’s two flagship universities has actually declined over the past three and a half decades. 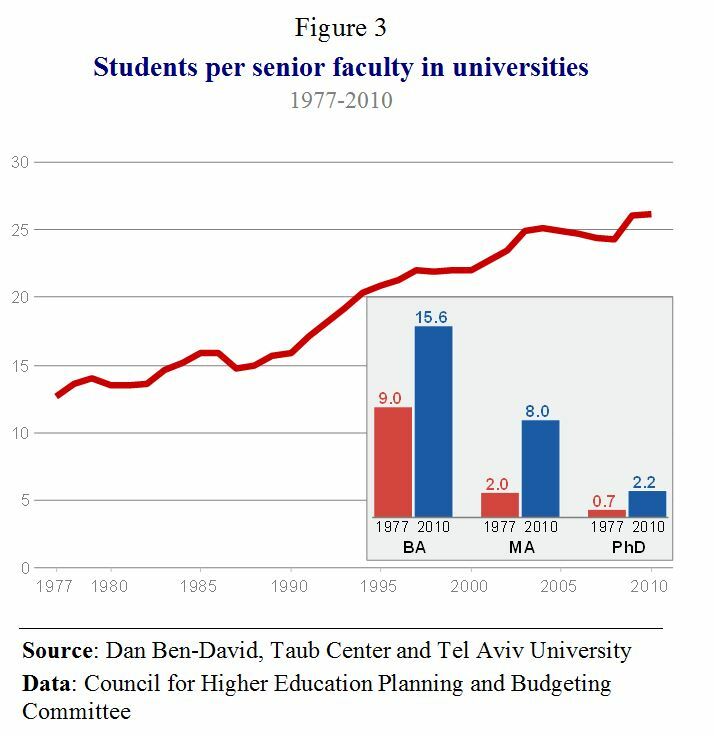 There were 17 percent fewer faculty positions in 2010 at the Hebrew University than there were in 1973 – and 26 percent fewer positions at Tel Aviv University. The Technion has lost over a quarter (26 percent) of the faculty positions that it had nearly four decades earlier. Between 1977 and 2010 (Figure 3), the number of students per senior faculty member more than doubled, from 12.6 students per professor to 26.1, but as Prof. Dan Ben-David notes, “the situation is considerably worse than reflected in these numbers when it comes to the issue of relaying state-of-the-art findings to the next generation of researchers – who are today’s graduate students.” The number of PhD students to professors rose from less than one student per faculty member to over two students per professor and the number of MA students to professors rose four-fold, from two to eight. To fill the teaching void, the research universities essentially outsourced. 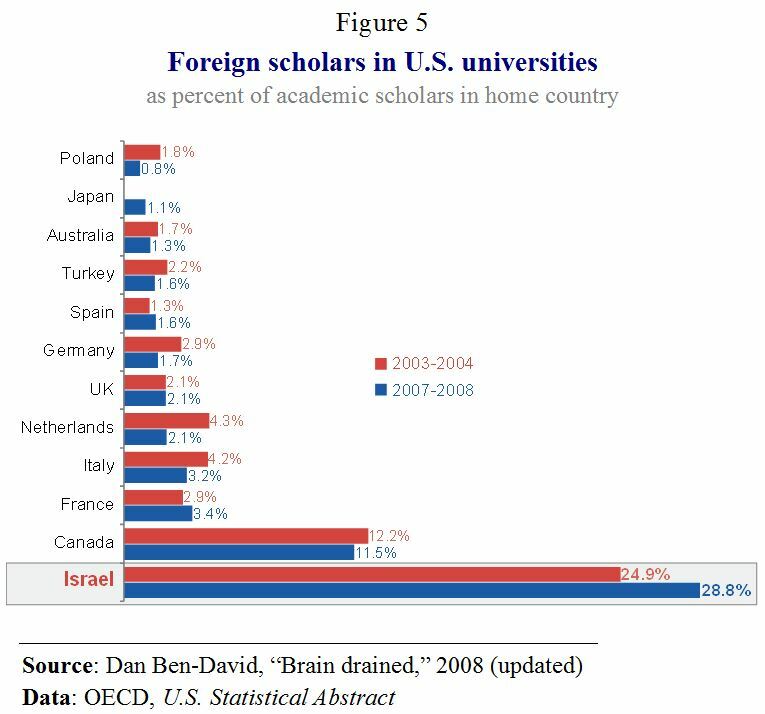 The Taub Center study shows that the country experiencing the greatest brain drain of its scholars to the United States – by several orders of magnitude – is Israel (Figure 5). In 2003-2004, there were 25 Israeli scholars in the United States for every 100 members of the academic faculties in all of Israel’s universities and colleges. This compares to 1-4 scholars in the U.S. for all other countries except Canada, with 12.